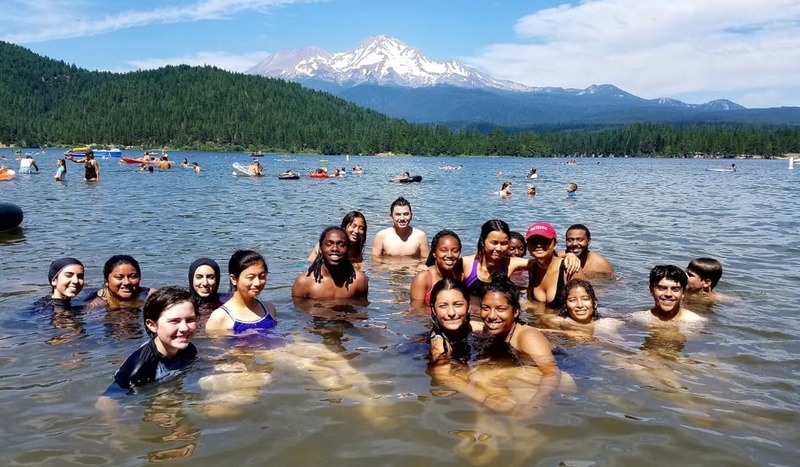 Swimming in Lake Siskiyou, at the foot of Mt. Shasta. We camped here. We swam in the clear water that flows from the glaciers. We played, sang, and built a perfect campfire. As it grew dark, we ate hot dogs and watched the yellow light of the fire shine off the faces of one another. We shared stories and reflections about the first days of our pilgrimage, and how we have worked to combine recreating in nature, with the task of self change and transformation. When we finished dinner, the park ranger came up and asked to speak with us. He instructed us to make sure all food was put securely away in our truck, and to make sure none of us had any candy, gum, or junk food in the tents. The night before, the bears had visited the campground, he explained. Ranger John said that as long as there’s no food out, there’s no problem. Yet the night before, the family did not put their food away and the children in the tent had candy bars. The bears were after the candy. While it was a serious message, Ranger John made us laugh at the image of a bear wanting a Snickers candy bar. But we got the point, it is beautiful to coexist with nature. All creatures have their place. We were camping in the home of deer, bears, and chipmunks. We saw the deer, played with the chipmunks, but luckily did not run into any bears. In the morning we left Lake Siskiyou and followed the Sacramento River down past Dunsmuir and Redding, and into the great Sacramento Valley. Here the beauty of water and the mountain were replaced with heat, agricultural fields and more new adventure ahead!